When the cold temps start to hit, I think we tend to gravitate towards all black looks and darker neutrals. I admit that I am totally guilty of doing this from time to time. It doesn’t have to be that way though as there are so many fun and unexpected color combos and prints that we can wear during the colder months. 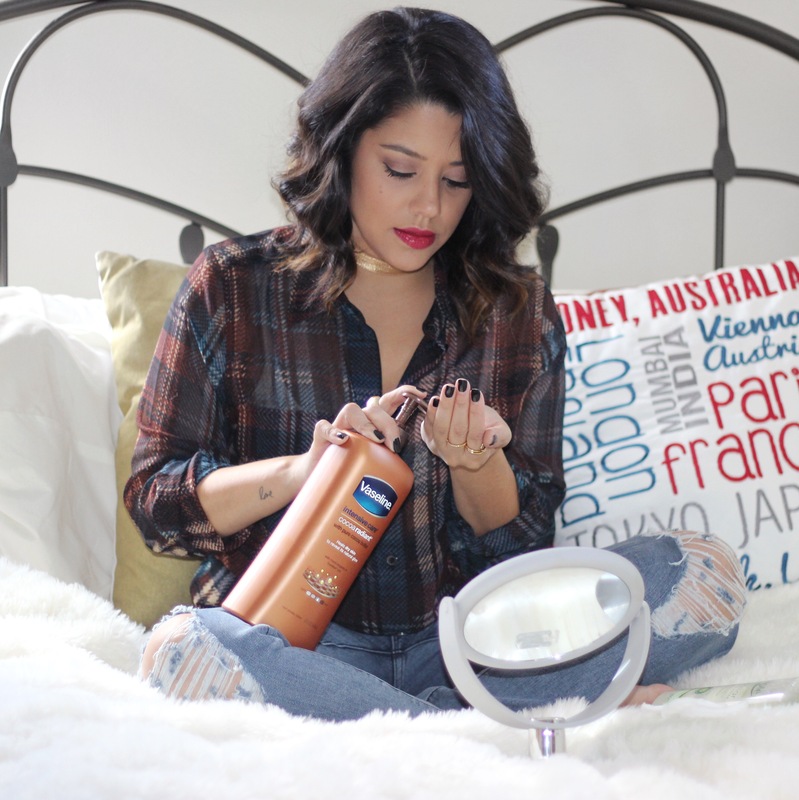 I’m excited to have partnered with Unilever and Who What Wear to show you some of the ways that I wake up my style and skin for the fall season! unexpected. I am all about plaid print this time of year and this sheer top is a fresh take on the current trend. I especially loved the hints of burgundy/dark brown and blue. I decided to style both of these pieces with a pair of distressed denim and burgundy pumps. I personally love the tan and burgundy color combo and adding in the blue tones was an extra bonus! A color scheme like this one is such a fun way to brighten up your fall outfits. I also think that tan and burgundy should be the new go-to color combo for the season instead of the typical black and grey. Does anyone else agree? If you choose to wear neutrals during the colder months, I think you should mix it up in a way so that it doesn’t feel boring. That was my goal with this second look. I picked out the tan and black striped sweater purposely for two reasons. One, I don’t wear enough striped print and two, my immediate instinct was to pair the sweater with all black. I really wanted to challenge myself to come up with something different. I decided to style it with white denim and instead of going with the typical black shoe, I went for my tan and black cap toe block heels. If I wore this with all black it would feel very obvious, so styling it this way makes it more unexpected! I think the most important part about fashion and finding your personal style is just to have fun with it and try new things. Let it flow and don’t overthink it and most importantly, don’t be afraid to challenge yourself from time to time, even if it’s in the smallest way. fullness, which is essential for me. I am all about that extra volume, especially during the fall and winter because my hair tends to get flat very easily from the cold. 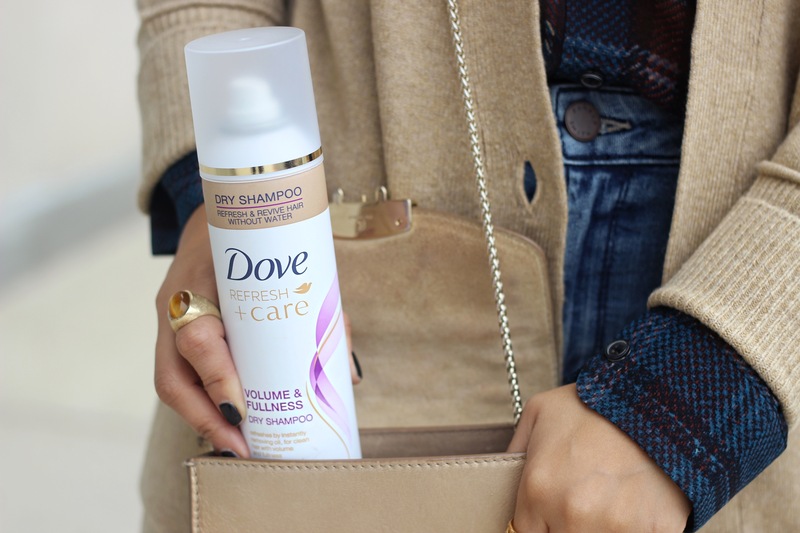 Dove Refresh Dry Shampoo is a great way to stay on top of this. because we aren’t showing our legs and arms as much. I am totally guilty of this. The cold weather can be so harsh on our skin though, so now more than ever we need to stay on top of this! It’s also essential for us to take proper care of our faces. I’ve been using Simple Micellar Cleansing Water for a long time now and it’s one of my beauty go-tos for removing makeup and cleansing. It instantly makes my skin feel hydrated and refreshed. The best part is that you don’t have to rinse anything off after, you just apply the micellar water with a cotton round and your makeup comes right off. I sometimes even use this after showering in the morning for an extra cleanse and to make sure my face is completely clean and fresh. I drink a lot of coffee and not enough water so because of this it totally dehydrates my skin, which is why I’ve made sure to incorporate this into my beauty routine! Hope you enjoyed today’s post! What are some of the ways that you plan to wake up your style and skin for fall? Check out more of my collab with Who What Wear here! Disclosure: This post was sponsored by Unilever and Who What Wear. As always, all opinions expressed are my own. The Best Black Friday & Cyber Monday Deals! Love all the looks but my fave is the white Pants and stripes top! And ps i have to try tHat dry shampoo ! I live for dry shaMpoo! Loving all your looks! I’m going to have to try that dry shampoo. I’m always on the look out for a new one. OMG! I CAN’T BELIEVE THAT SWEATER IS ONLY $24.99. MUST HAVE!